Pick and choose, some or all, from six student assignments with relatable, real-world examples to engage students’ interest. Each assignment comes in manual or Excel options, as well as alternate solution versions. Students can submit answers to homework online, as well as upload Excel files. Armond Dalton’s website automatically grades answers and easily exports to a course management system. An overview of assignments with related Core Concept Reviews that serve as a quick reference of the underlying concepts developed in principles of managerial accounting textbooks. 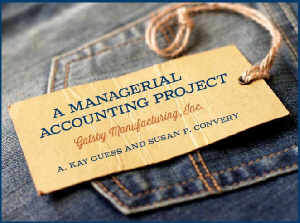 Assignment 1: Reconcile manufacturing-related inventory accounts with job cost sheets and trace transactions through source documents to job cost sheets. Assignment 2: Record cost accounting information into the General Journal and General Ledger. Assignment 3: Prepare financial statements for a manufacturing company at the end of a year. Assignment 4: Contrast different costing systems related to overhead and overhead drivers for multi-product companies. Assignment 5: Prepare a master budget for a manufacturing company with two divisions and analyze variances. Assignment 6: Evaluate a capital budgeting decision made by managers.